Just Anthony specializes in fine Chinese home decor including antique furniture, classic and modern reproductions, made-to-order furniture, accessories, wood carving, stone statues and hand painted silk wall coverings. The boutique takes pride in its extensive collection of wall cover designs with classic Chinese style. Individually hand painted by artisans and dedicated craftsmen; you can expect dramatic full wall masterpieces that will transform the entire room or home into a chic and warm space. Located near the East Coast area, the shop is quite off the usual tourist track. The first impression of the premises is not that of a sophisticated, stylish shop, yet once you get inside, the extensive quantity and quality of the items on display will certainly impress. 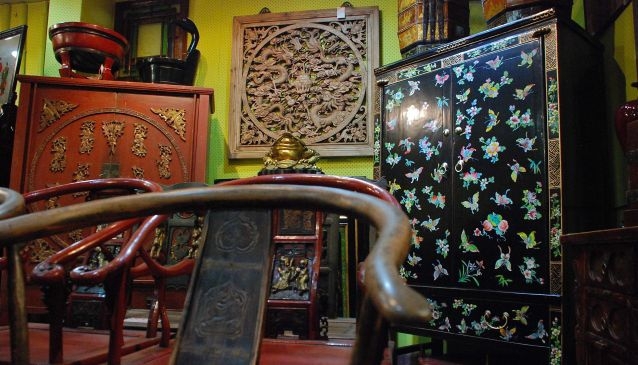 There are beautiful lamps, charming Buddha statues, fantastic wall paintings and lacquer ware as well as a huge number of colourful and classic cabinets, chairs and table sets. The service is friendly and attentive, yet relaxed and discreet if you just want to take your time to have a look by yourself. If really you can't find the perfect piece for your home, approach the friendly father and daughter team for advice. With their furniture-made-to-order service, your dreams of an individual piece for your home are just a few steps away. They can also advise you on overseas shipping.